South Australia has announced to make major changes in the general skilled migration requirements. These immigration changes are expected to impact candidates who are either seeking high point or the chain migration nomination. The Southern Central State of Australia has announced to increase the prerequisite for high points state nomination to 85 from 80. This decision was taken after the entire quota of the nominations under the 80 point requirement was capped. The new 85 point system will come in force on the morning of 19th April 2017. It has been also announced that the applications which have been lodged prior to 19th April won’t be affected by this change. “Applications for high points nomination received after this time will be refused if they fall short of the required 85 points,” said Immigration South Australia. There are a couple of occupations which have not been included under the umbrella of high points and chain migration streams. 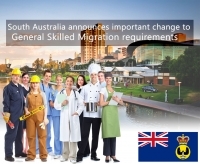 As per the announcement made by the Immigration South Australia, with immediate effect the occupation ranging from Account professionals (General), Human resources Advisers, Marketing Professionals, Sales Representatives, University Lecturers &Tutors, Hospital Pharmacists and Retail Pharmacist occupations won’t be included under the high point or chain migration. The application submitted before this announcement won’t be affected by this announcement.